It’s the successor of TBS6984. 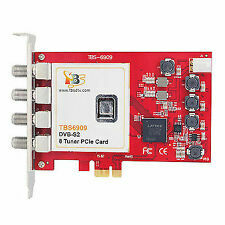 Even more if you want to make full use of the recording power of TBS6985, you may record four whole TS(Transponder Stream),one of which could contains maximum ten, twelve SD or HD TV channels into your PC hard disk. Trending at $33.41eBay determines this price through a machine learned model of the product's sale prices within the last 90 days. DIRECTV R16-300 Receiver. Condition is Used. Shipped with USPS Priority Mail. Sorry no network chip card. See photos. HDMI cable. Premium AV cable. Perfect "FTA" receiver for C-Band, Ku-Band - any dish. FORTEC STAR LIFETIME ULTRA DIGITAL SATELLITE SYSTEMS RECEIVER *FAST SHIPPING*. Condition is Used. Shipped with USPS First Class Package. We're just two normal people earning a living right here in the USA! (Just outside Seattle) We might make a mistake. If for any reason you are not satisfied with your product we will make it right. DIRECTV Manufacturer DIRECTV Item Condition NO CARD INCLUDED. Item(s) will have a 4"x2" internal inventory label, see pictures. Does Not Apply Manufacturer Part Number Weight (lbs): 10.00. Part Number: HR24. DIRECTV's HR24 HD DVR is the best solution for watching and recording TV. Sleek design with a touch sensitive panel. Operates quietly and is energy-star certified. H24 and HR24 installed on systems that DO NOT have a SWiM Switch require B-Band Converters. 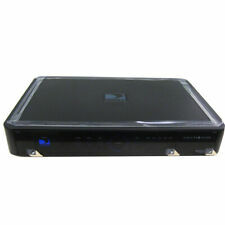 Direct TV DVR HD Receiver Model HR20. Condition is Used. Shipped with USPS Priority Mail. This has been used. Single owner both smoke and pet free home. No cords or remote. Please review all photos and ask questions prior to purchase. Good as New Manufacturer Refurbished 5 Tuner Genie DVR.... Black Whole Home DVR comes with Remote, HDMI candle and power chord! Ready to activate with Data card box is Owned! Power Inserter - Model PI21R1-03. Serial number on Receiver G28CA3HK503393. Run your mouse over the photos for a larger view. Add. 50 for handling. Don't Miss out on this one! 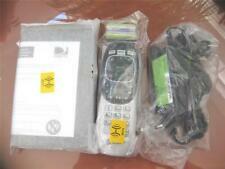 DirecTV + DVR Digital Satelite Receiver R16-300. 2 Cords to the TV. Batteries included. 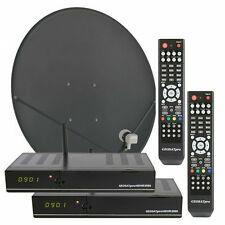 3.5 out of 5 stars - DirecTV + DVR Digital Satelite Receiver R16-300. 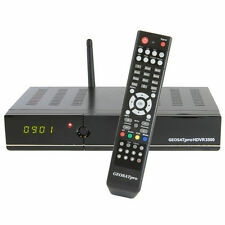 11 product ratings11 product ratings - DirecTV + DVR Digital Satelite Receiver R16-300. DirecTV AM21. Model: AM21. Dual ATSC tuners. Seamlessly integrates off-air HD channels into the DIRECTV on-screen program guide. Designed to rest perfectly on top of the DIRECTV Plus HD DVR. Depth: 12.25". All pictures show the actual items for sale. There are no stock photos!! The previous owner informed me that everything was working perfectly. All items appear to be in very good used condition. However, I am unable to test the equipment. Therefore everything sells as is with no returns or refunds. Please be sure to do your research and study all the pictures closely before buying or sending an offer as there are no returns or refunds! Thank you. Please feel free to ask questions and request more pictures. Have an excellent week! Lot Of DirectTV Accessories DVR HD Receiver HR44-500 C-51-100 Remotes - SEE PIC. Condition is Used. Shipped with USPS Priority Mail. Topfield TF5000PVR Personal Video recorder with remote control! This item is used with a few scratches to the casing but no major cosmetic damage. It has been tested and is in working condition - the hard drive has been wiped. Listing is for the PVR with attached power cable and remote control only.